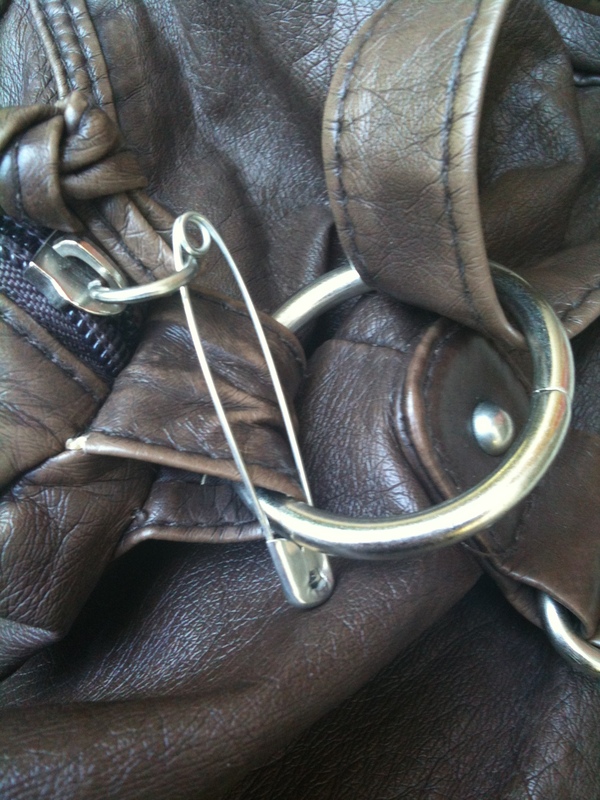 A safety pin lock prevents casual theft. We’ve all heard the stories – pickpockets, slashed purses, petty theft. Unfortunately, it is a normal part of travel. How does a woman protect against such things, especially when carrying only one bag? I tried a Pacsafe purse. I found out that I didn’t use it. Oh, it worked fine. But it was quite heavy, didn’t hold much (for the weight) and didn’t pack well inside my main bag. It screamed “I have something valuable inside of me!” and marked me as a tourist. On top of that, the thing was ugly. I ended up abandoning it for a regular cross body bag. Did that leave me exposed to casual theft? Not as much as you might think. You see, a few years ago a missionary friend of mine gave me the answer to the theft problem. He called it the “rule of 3”. A small “size 0” s-biner will clip the zipper slide to the purse hardware. This is a very discrete way of securing your purse. The “rule of 3” is based on how casual thieves operate. Thieves are opportunistic. They want to act quickly. Anything that slows them down increases the chance that they will get caught. So anything you can do to slow them down makes them nervous. Slow them down enough and they will get scared and abandon you for an easier target. How do you slow a thief down? By making it hard to get to your valuables. Most thieves have 2 hands. That means that they can perform 2 coordinated tasks quickly, such as unzipping a purse and grabbing a wallet. Most thieves aren’t coordinated enough to get past 3 steps. So I always make sure that it takes at least 3 steps to get to my stuff. The first step is to lock my purse. This can be as easy as pinning the zipper slide closed (step 1). 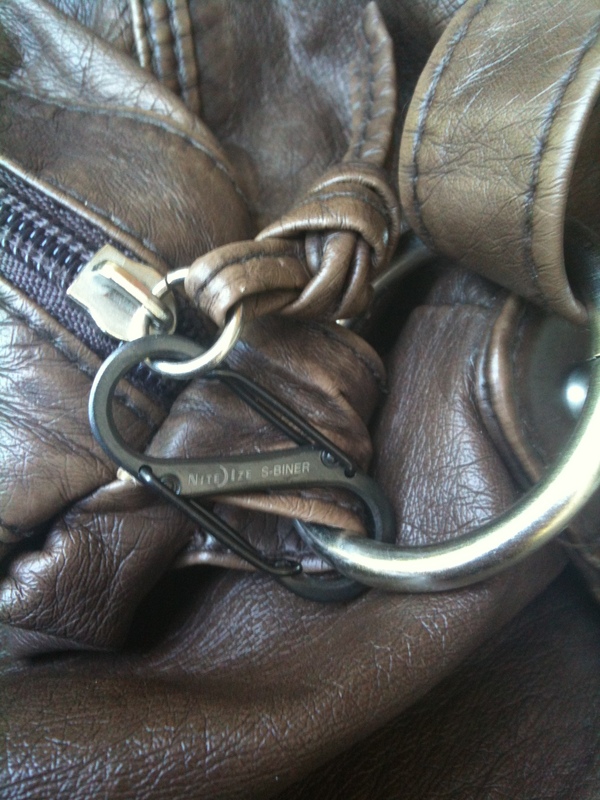 If I want to open my purse, it isn’t a big deal to open the safety pin. If you want something a little nicer, consider using a small s-biner (size 0 works well). 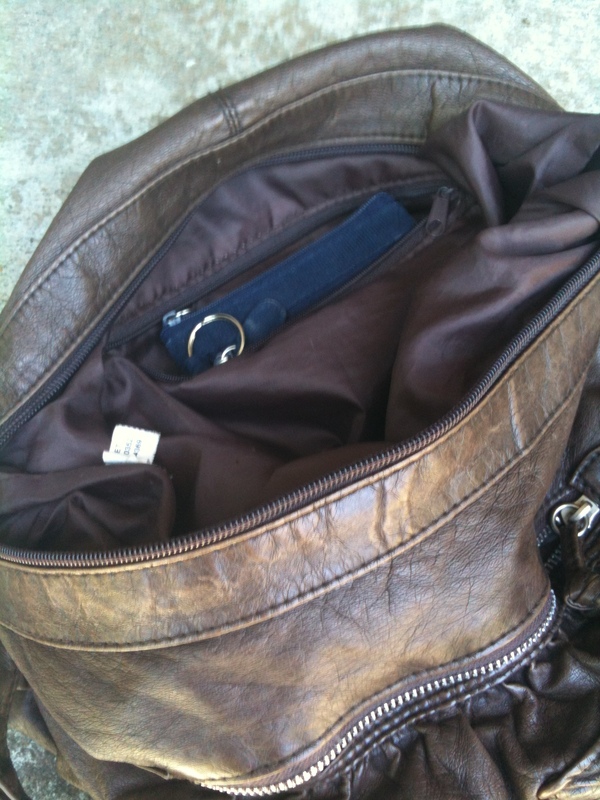 Next, I always make sure my purses have an inner side pocket. That is where I store my working wallet (step 2). If someone were to slash my purse they will probably miss the wallet that is suspended in the side pocket. As a bonus, the wallet is easy to find within the yawning void of my purse. Last, I will zip the inner purse pocket closed (step 3). Wearing the purse as a cross-body bag in front of me creates additional security (step 4). 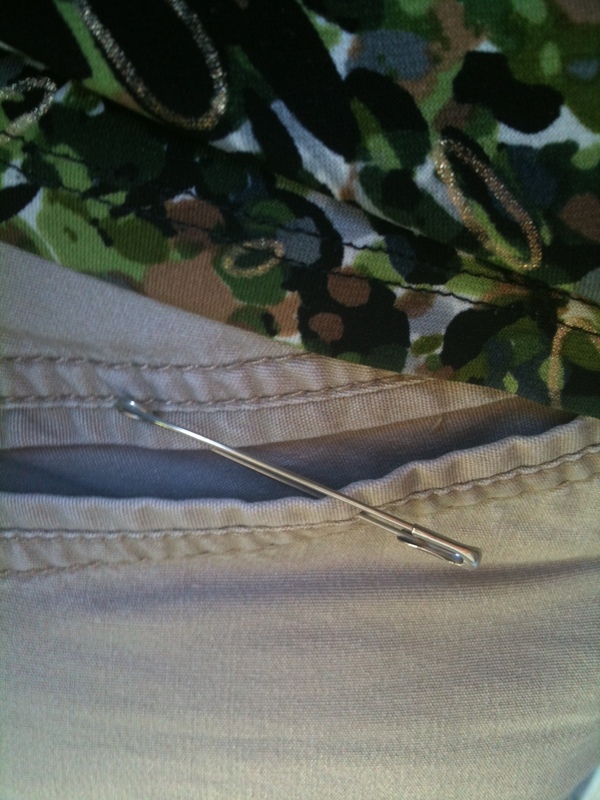 A safety pin secures a pocket closed. I will do the same thing if I have my wallet in my pocket. I like to buy travel pants that have security pockets inside the normal pockets (step 1). These pockets zip up (step 2). Again, I’ll run a safety pin through the zipper to “lock” it (step 3). Many times I will also pull my shirt over the top of the pocket (step 4). So does it work? Well, I’ve found one slash mark on my purse – but the purse was so soft that they couldn’t cut into it. I’ve also found several unclipped s-biners and open (or missing) safety pins. In one case the zipper was actually open by a few inches – so one thief made it half-way through step 2. But so far, the thieves have yet to make it past the other steps. And that is exactly how I like it. I like these plans, thanks for the advice! Good tips! My most successful tips would be don’t look like a tourist. That means in don’t carry a big camera, guidebook, map openly, adapt slightly to what is worn locally (in Europe you can often identify American tourists on their baggy jeans and white sneakers) and don’t ever carry your back pack on your stomach! In Europe I usually carry an over the shoulder bag at a level where I can just clamp my arm over it if I’m somewhere where I can suspect pick pockets (and I do that in my own home town as well!) and possibly slide it towards the front of my body. If I carry a back pack with full zippers I make sure they are locked at the bottom end of the back pack (does that make sense?) or preferably under a clamp of some sort. Also, in countries which have high value coins I usually carry a coin purse as well, so that I most of the time don’t even have to take out my travel wallet. The coin purse is often stored in a more accessible pocket or on my body, while my wallet is in a zipped pocket in my purse, under my arm. I also zip my pack zippers all the way around to the bottom of the pack. The zippers won’t come undone with the bouncing of the pack. But in town, it’s the cross body bag for me! I’ve been reading your blog for a while, getting lots of great ideas, thank you. I have a question about the security of a bag I bought for an upcoming trip to England. http://www.kipling-usa.com/machida-crossbody-bag/HB6222.html I’ve used Kipling bags at home and chose it for it’s light weight, shape, compartments and water resistance. However, I now realize that I can’t lock the top zipper. I have two suggestions. It looks like the bag has two zippers. Secure the one at the top with an S-biner or a safety pin. I have pictures in my post on The Best Day Bags for travel. The side zipper is tricker. You could sew a small ring finding to the side of the bag and then use another S-biner to lock it. My post Travel Hack: Adding a Luggage Security Ring shows the details. I’d Go to a sewing store and find a smaller ring than the one used on the suitcase. Look in the jewelry/beading section. I keep my wallet clipped to a strap attached to the lining of the bag at all times, not just when traveling. This would add a step, makes it easy to find and also keeps me from absent mindedly leaving it behind. Incidentally some small wristlets from Hobo or Baggalini can convert from wallet to dressy crossbody bag for evening, so all you have to pack is the long strap. Yes. I use a strap too. I’ll sew one in if it doesn’t exist. Safety wallets and wallet tethers were one of my early blog posts. These is great advice! I am very curious as to the countries/cities where you have noticed that the thieves managed to unclip or remove the safety pins? I live in Paris and you’re right, you need to pay close attention to your belongings. Thanks!